Metronomy was born ten years ago in the tiny, bohemian market town of Totnes in Devon, when Joseph Mount got his first computer and started making electronic music inspired by the likes of Autechre and Aphex Twin. Metronomy’s debut album, released in 2006, was called Pip Paine (Pay The £5000 You Owe) and its largely instrumental electro-pop reflected the eccentricity of its title. 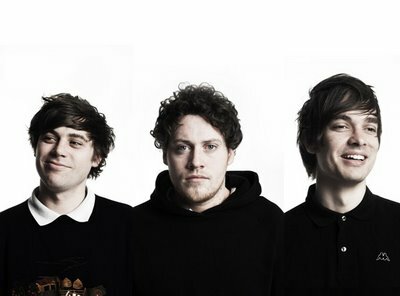 Joseph admits that he only, finally, saw the commercial possibilities of Metronomy when DJ/producer Erol Alkan began to feature the single “You Could Easily Have Me” in his sets, and asked Metronomy to play at his club. Cue the need for a proper live show, and the additions of Gabriel (keyboards and bass) and Oscar (saxophone, backing vocals and keyboards). Move on 2 years to the sophomore album Nights Out, a second album that feels like a debut. the first to be vocal-led, with the self-effacing Joseph stepping up and grabbing the mic for most of the tracks. Check out the excellent single “Heartbreaker” remixed by French electropop duo Jupiter.